Ubuntu has now supported UEFI booting and Secure Boot for long enough that it is available, and reasonably up to date, on all supported releases. Here is how Secure Boot works. 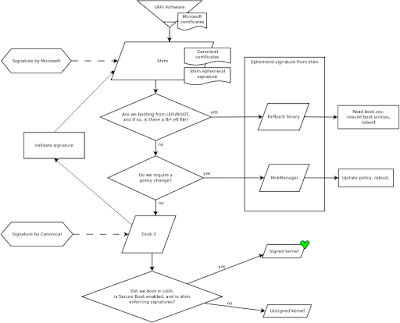 I'm including a diagram here; I know it's a little complicated, so I will also explain how things happen (it can be clicked to get to the full size image). In all cases, booting a system in UEFI mode loads UEFI firmware, which typically contains pre-loaded keys (at least, on x86). These keys are usually those from Microsoft so that Windows can load its own bootloader and verify it, as well as those from the computer manufacturer. The firmware doesn't, by itself, know anything special about how to boot the system -- this is something that is informed by NVRAM (or some similar memory that survives a reboot) by way of a few variables: BootOrder, which specified what order to boot things in, as well as BootEntry#### (hex numbers), which contains the path to the EFI image to load, a disk, or some other method of starting the computer (such as booting in the Setup tool for that firmware). If no BootEntry variable listed in BootOrder gets the system booting, then nothing would happen. Systems however will usually at least include a path to a disk as a permanent or default BootEntry. Shim relies on that, or on a distro, to load in the first place. Once we actually find shim to boot; this will try to validate signatures of the next piece in the puzzle: grub2, MokManager, or fallback, depending on the state of shim's own variables in NVRAM; more on this later. In the usual scenario, shim will validate the grub2 image successfully, then grub2 itself will try to load the kernel or chainload another EFI binary, after attempting to validate the signatures on these images by way of asking shim to check the signature. Shim is just a very simple layer that holds on to keys outside of those installed by default on the system (since they normally can't be changed outside of Setup Mode, and require a few steps to do), and knows how to load grub2 in the normal case, as well as how to load MokManager if policy changes need to be applied (such as disabling signature validation or adding new keys), as well as knowing how to load the fallback binary which can re-create BootEntry variables in case the firmware isn't able to handle them. I will expand on MokManager and fallback in a future blog post. Your diagram says shim is signed by Microsoft, what's up with that? Indeed, shim is an EFI binary that is signed by Microsoft how we ship it in Ubuntu. Other distributions do the same. This is required because the firmware on most systems already contains Microsoft certificates (pre-loaded in the factory), and it would be impractical to have different shims for each manufacturer of hardware. All EFI binaries can be easily re-signed anyway, we just do things like this to make it as easy as possible for the largest number of people. One thing this means is that uploads of shim require a lot of effort and testing. Fortunately, since it is used by other distributions too, it is a well-tested piece of code. There is even now a community process to handle review of submissions for signature by Microsoft, in an effort to catch anything outlandish as quickly and as early as possible. Why reboot once a policy change is made or boot entries are rebuilt? All of this happens through changes in firmware variables. Rebooting makes sure we can properly take into account changes in the firmware variables, and possibly carry on with other "backlogged" actions that need to happen (for instance, rebuilding BootEntry variables first, and then loading MokManager to add a new signing key before we can load a new grub2 image you signed yourself). grub2 is not a new piece of the boot process in any way. It's been around for a long while. The difference from booting in BIOS mode compared to in UEFI is that we install an UEFI binary version of grub2. The software is the same, just packaged slightly differently (I may outline the UEFI binary format at some point in the future). It also goes through some code paths that are specific to UEFI, such as checking if we've booting through shim, and if so, asking it to validate signatures. If not, we can still validate signatures, but we would have to do so using the UEFI protocol itself, which is limited to allowing signatures by keys that are included in the firmware, as expressed earlier. Mostly just the Microsoft signatures. grub2 in UEFI otherwise works just like it would elsewhere: it try to find its grub.cfg configuration file, and follow its instructions to boot the kernel and load the initramfs. When Secure Boot is enabled, loading the kernel normally requires that the kernel itself is signed. The kernels we install in Ubuntu are signed by Canonical, just like grub2 is, and shim knows about the signing key and can validate these signatures. At the time of this writing, if the kernel isn't signed or is signed by a key that isn't known, grub2 will fall back to loading the kernel as a normal binary (as in not signed), outside of BootServices (a special mode we're in while booting the system, normally it's exited by the kernel early on as the kernel loads). Exiting BootServices means some special features of the firmware are not available to anything that runs afterwards, so that while things may have been loaded in UEFI mode, they will not have access to everything in firmware. If the kernel is signed correctly, then grub2 leaves the ExitBootServices call to be done by the kernel. Very soon, we will stop allowing to load unsigned (or signed by unknown keys) kernels in Ubuntu. This is work in progress. This change will not affect most users, only those who build their own kernels. In this case, they will still be able to load kernels by making sure they are signed by some key (such as their own, and I will cover signing things in my next blog entry), and importing that key in shim (which is a step you only need to do once). In UEFI, the kernel enforces that modules loaded are properly signed. This means that for those who need to build their own custom modules, or use DKMS modules (virtualbox, r8168, bbswitch, etc. ), you need to take more steps to let the modules load properly. In order to make this as easy as possible for people, for now we've opted to let users disable Secure Boot validation in shim via a semi-automatic process. Shim is still being verified by the system firmware, but any piece following it that asks shim to validate something will get an affirmative response (ie. things are valid, even if not signed or signed by an unknown key). grub2 will happily load your kernel, and your kernel will be happy to load custom modules. This is obviously not a perfectly secure solution, more of a temporary measure to allow things to carry on as they did before. In the future, we'll replace this with a wizard-type tool to let users sign their own modules easily. For now, signature of binaries and modules is a manual process (as above, I will expand on it in a future blog entry). If nothing happens, it's because you already have shim validation enabled: nothing has required that it be disabled. If things aren't as they should be (for instance, Secure Boot is not enabled on the system), the command will tell you. And although we certainly don't recommend it, you can disable shim validation yourself with much the same command (see --help). There is an example of use of update-secureboot-policy here. wasn’t that called restricted boot instead? I'm not sure what you're referring to. If it's FSF's "concept" of "Restricted Boot"; I wouldn't be able to comment much. The intent here is that users are able to load what they need, and decide for themselves what is approved to boot (ie. we don't enforce that what boots must be an unchanged Ubuntu kernel, for now you can toggle shim's validation). The plan is to let users enroll their own key and sign things themselves easily (and that is precisely letting users approve things for themselves); so I don't know what you're referring to.